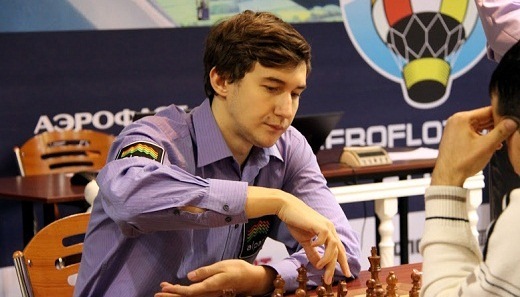 Sergey Karjakin defeated the fellow Russian Alexander Grischuk 2-1 in the final match of the Aeroflot Rapid to take the top prize of 16,000 USD. Grischuk earned 10,000 USD. Karjakin is reigning World Rapid Champion, while Grischuk is reigning World Blitz Champion. After the two regular rapid games finished in draws for the 1-1 tie, the players proceeded to the Armageddon game where white (Karjakin) had 5 minutes vs black’s 4 minutes and draw odds. The planned 30 sec increment after move 61 was never reached as Grischuk flagged earlier in the winning position. This outcome is a flashback to the recent Piterenka tournament where Karjakin saved similarly hopeless position against the same opponent. After the yesterday’s knockout stage, four players qualified for the semifinal matches – Nepomniachtchi (who earlier won the Aeroflot Blitz Championship), Grischuk, Kamsky and Karjakin. Grischuk used the white pieces to eliminate Gata Kamsky with 1,5-0,5, while Karjakin had to play another Armageddon after the 1-1 tie against Nepomniachtchi. This game Karjakin won convincingly to schedule the clash with Grischuk. The traditional Aeroflot Open started immediately after the International Chess Festival Moscow Open-2013, from 11-18 February in Moscow, Russia.